In this second installment of How to look at houses (like an architect), we’re going to pick up where we left off in the first installment where we talked about the base of home. While the first installment focused primarily on foundation walls, this time we’re going to talk about foundation piers, openings and bulkheads. 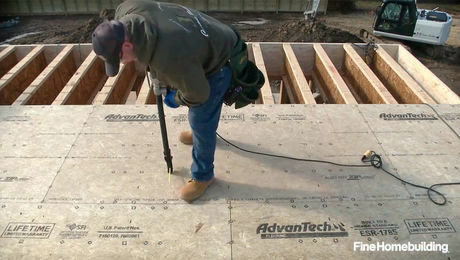 Foundation piers allow a building to tread lightly on its site. They can be made of a variety of materials, such as wood, poured-in-place concrete, brick, stone, or precast concrete. Because buildings on piers can be difficult to insulate, pier foundations are best suited to outbuildings, porches, and seasonal spaces. Most of us live in homes with foundation walls, and often we need to make openings in those walls for access and/or daylight. Foundation hatches, windows, and doors can be fashioned to highlight or downplay their presence. Sometimes foundation openings continue below grade and require an areaway space to be carved from grade to accommodate them. Areaway design needs to take into account drainage and safety issues. The easiest way to cover an areaway is with a bulkhead, which commonly has a utilitarian steel design. Bulkheads, however, can be shaped into unique forms, be made of other materials, and incorporate hardware as a design feature. The base of home is rich with nuanced opportunities to express an attitude toward how a home meets the ground and how that meeting can be modulated, opened, shaped, covered, and even fun. Watch more videos in the how to look at houses series.